How a Wife Beating, Serial Killer Puppet Gave Us the Expression "Pleased as Punch"
As a child you might have wondered how a bowl of punch could be pleased about anything. Turns out, the saying has nothing to do with the drink. Rather, “punch” refers to the character in Punch and Judy, a puppet show that has its roots in Italy’s 16th-century commedia dell’arte. The show continued to gain popularity and, by Victorian times, was being played in all of the major cities in England. Today, Punch and Judy is still performed, though it is much more popular in the UK and Europe than it is across the pond. If you’re unfamiliar with the show, you might be wondering what it’s all about. It’s a sort of “variety” puppet show that acts as a living history—the show is always kept topical, which is a major reason why it has remained so popular over the years. No two shows are exactly alike. Instead, they stay true to the issues of the time, often mocking current political leaders. For instance, Hitler was once featured in the show, and more recently, former British Prime Minister Tony Blair made an appearance. So, how exactly is he “pleased” again? Punch is always gleeful about the mayhem he produces, and appears to be self-satisfied by committing heinous crimes. Oh! how my fingers itch to pull thy nose! As pleased as Punch, I’d hold it in my gripe. I am as proud as Punch to think that I once had the honour of being connected with your family. Today, “pleased as punch” is the much more common phrase, while “proud as punch” has faded into the background. It’s funny to think that we owe it all to a wife-beating, serial killer puppet—but the phrase certainly makes more sense when you know it isn’t attributed to the stuff in your punch bowl. When it started, the show was probably played out by real actors. However, the commedia del’arte was filled with actors demanding high wages, and it’s likely that marionettes replaced them by the 17th century in order to cut back on costs. Somewhere along the line, marionettes were replaced by the hand puppets that are still used today. Punch and Judy performers sometimes call themselves “Professors.” This stems from a myth that King Charles II, who reportedly enjoyed the puppet shows, passed a law decreeing that all Punch and Judy workers were to be given this title. The original street shows often featured a “bottler,” a person who would introduce the show and then collect money from the audience in a bottle. Bottlers started to become irrelevant when the workers started getting paid to do the shows at private venues, such as for children’s birthday parties, and collecting money wasn’t an issue. Punch and Judy is extremely prevalent in British popular culture, featured in songs, comic books, children’s books, adult fiction, movies, and T.V. shows. Notably, Punch and Judy have appeared in Doctor Who, the 2000 film version of 102 Dalmatians, and Midsomer Murders. Due to their fame, Punch and Judy were named an icon of Britain, ranking up there with red double-decker buses. In the United Kingdom, insults and accusations are exchanged between rival members of Parliament, in something that has become known as “Punch and Judy politics.” Prime Minister David Cameron used the phrase in a speech given in 2005. 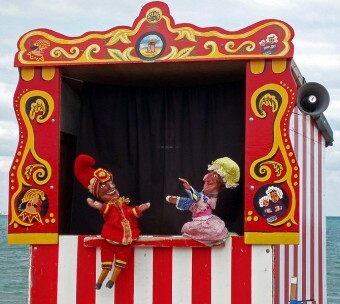 Though Punch and Judy is still most popular in the United Kingdom, other countries—including its birth place, Italy—still have their own versions of the show. Though Punch and Judy might not be as familiar to Americans as it is to the British, the puppet show is present in the U.S.; it made its way over the Atlantic in the late 1700s, and George Washington himself supposedly bought a ticket to see it.